It’s an Alaska Fun Friday: May the Fourth Be With You! May is bustin' out all over Alaska! Just a little humor to begin the weekend. It is indeed the Fourth of May, and another Alaska weekend of family fun is at our fingertips. So much is happening around southcentral Alaska this weekend, I hardly know where to begin. Thanks as always to Alaska Center for Pediatrics, our Fun Friday sponsor, caring for kids since 1982. Is your smartphone calendar ready? Here we go! Head to downtown Anchorage this weekend. Seymour will be there, too, I betcha! FRIDAY: Take the kids downtown tonight for two excellent opportunities. One is the monthly First Friday event held at the Anchorage Museum. Beginning at 5:30, admission will be FREE, giving your family the perfect opportunity to wander this world-class facility. Hear a mountaineering talk, check out the guided star show, or listen to some music in the lovely Atrium area. This event includes, of course, the Imaginarium Discovery Center, so hurry down after work or school for a great way to kick off the weekend. The second event tonight is the Visitor Industry Charity Walk, starting at the Dena’ina Center around 6 p.m. One has to sign up for this popular “Graze to Raise” moneymaker for local charities, and if you missed the early registration, you can still hustle downtown between 4:30-6 p.m. and receive your bib for the 5k (and completely untimed, non-competitive) event. Fees vary according to “team”. SATURDAY: All aboard! The Alaska Railroad is hosting their annual Open House from 11 a.m.-3 p.m. at the Anchorage Historic Depot (Fairbanks, you have your turn next Saturday). Check out the static displays, including Old Engine 557, take a free ride, eat a hot dog, and listen to music by our fabulous area military bands. This one is a winner, in AK Kid’s book, and we gladly accompany him every year. Hint: if you want a free train ride, get in line asap; this is the most popular aspect of the event. Like to run? Join the masses at Inlet View Elementary’s annual Salmon Run and Carnival, starting at 10 a.m. down near Westchester Lagoon. A variety of runs are available, including a Kids’ 2k, and do stick around for the carnival fun afterward. Alaska Wildlife Conservation Center staff welcome you to a presentation about their fast-growing Kodiak bear cubs Friday-Sunday at 7 p.m. Where did they come from? Where are they going? What do they eat? All these questions will be answered, plus you get to see the beautiful grounds of this center near Portage. Free presentation with regular admission. This Saturday is the final Science Saturday at Campbell Creek Science Center. Tweens and teens 10-14, accompanied by an adult, are invited to learn about “Creekside Studies” from 1-4 p.m. The most popular in the series, Saturday’s class will be full of wet, wild fun. Bring boots, warm clothing, and a great attitude! Call 267-1247 for info. $5/child, adults free. One-time 4-H fee of $6. SUNDAY: The Anchorage Museum continues its weekend of FREE-dom with Asian Pacific Family Day from 2-4 p.m. Enjoy crafts, music, and cultural experiences for the entire family. Psst – I hear the Taiko drummers from East High will be there, too; love that thunderous beat! Two happy humpbacks lazily cruise Resurrection Bay yesterday. EXTRA: I had the opportunity yesterday to swing down to Seward and take a day cruise aboard a Kenai Fjords Tour catamaran, and wowsa, what a super day it was! I saw eagles, tons of humpbacks (get it? ), sea lions, and enjoyed the CIRI Tourism hospitality and outstanding customer service. Don’t miss their early season specials, folks, you will truly enjoy the experience with your kiddos. Captain Tim even opened up the wheelhouse for folks to ask questions and enjoy the view on our way back to Seward. Hint, if you go Monday-Thursday (I know, I know, school’s not quite out yet, but goodness, are they really learning anything at this point? ), prices for the 4-hour cruise, lunch, warm cookies, and incredible interpretive narration by the captain is $89/adults, $44.50 for kids. 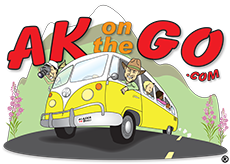 Stay tuned, because next week I’ll be talking more about our latest sponsor, CIRI Tourism, owner of Kenai Fjords Tours. Posted in Day Trips, Downtown Anchorage, Festivals and Events, Miscellaneous and tagged Alaska, Alaska Travel, Alaska Wildlife Conservation Center, Alaska with Kids, Anchorage. ← *EXTRA* Alaska Travelgram Show Podcast: Native Heritage Center and Great Airfare Deals!